Top Chef Canada All-Stars gets worldly and cuts one chef | TV, eh? 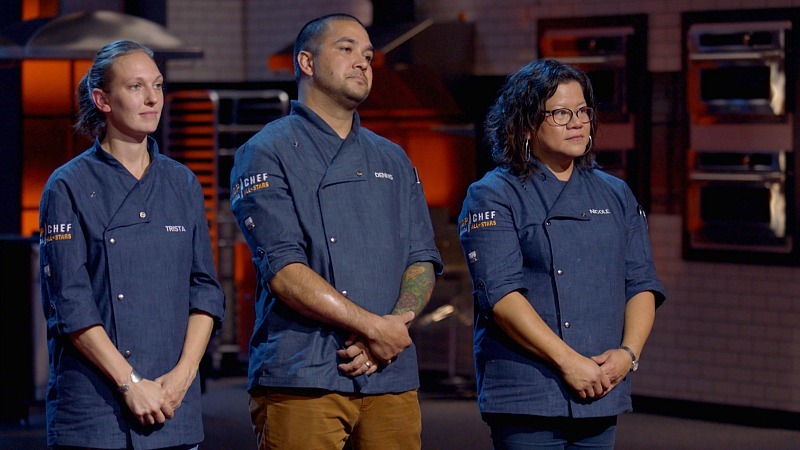 Man, did it feel great to tune into Top Chef Canada again: I didn’t realize how much I’d truly missed the franchise until the all-stars were back in the kitchen, dripping sweat and expletives on the way to creating foodie pieces of art. And, after a crash course in how tough this season is going to be, the 11 remaining we back at it on Sunday night. In “Street Markets of the World … Unite,” the Quickfire Challenge began innocently enough, with the Top 11 expected to produce perfect mise en place. This isn’t the first time that’s been done on Top Chef Canada, but the All-Stars edition came with a bit of a twist in the first round: filleting sea bass. I expected Todd Perrin to ace this one—he works with seafood every day—and he was the first to complete it. He, Dustin, Nicole, Andrea, Trevor, Jonathan, Jesse and Dennis moved on to Round 2. (Connie’s laser beam eyes betrayed her disappointment.) Shallots were up next and the chefs had to brunoise (dice to 1/8 of an inch) as many as they could in three minutes. Jesse, Todd, Dennis, Jonathan and Andrea made it to Round 3: shuck as many oysters as possible in four minutes. Dennis, who aced this test back in Season 1 in an arm cast did it again on Sunday with 14 perfect oysters. (Like Eden, my mouth was watering seeing all those mollusks lined up for consumption.) Dennis and Andrea (who shucked 13) went head-to-head in the finale: creating a plate using all of the ingredients they’d just prepped in 15 minutes. It was interesting to see Dennis and Andrea’s different visions for their food—he went with Vietnamese sweet and sour soup accented by fish and oysters and she decided the sea bass was the star of her plate—and then observe Mark McEwan and Eden’s reactions. Andrea won out (I was so hungry looking at that fish) and scored immunity for the week. Food markets around the world are bursting with ingredients unique to their regions and served as the theme for Sunday’s Elimination Challenge. Andrea’s advantage was being able to choose which country’s food she wanted to prepare and joined Brussels alongside Nicole and Curtis. The test was for the chefs to serve their plates to folks in a pop-up market at Toronto’s Artscape Wychwood Farms where patrons and Susur Lee voted on the best. But, rather than working as teams, everyone was on their own to come up with a recipe idea, prepping and serving to 75. As usual, Susur Lee was a perfect guest judge, able to enjoy food and point out where improvements could be made. (I’d be happy if he was there every week.) Tops in the judges’ eyes were Trista’s grilled lamb saddle, Dennis’ prawn toasts and Nicole’s potato-wrapped ground lamb, with Dennis winning the challenge. It was an impressive feat considering he had to completely rework the recipe after the empanada dough fail on Day 1. Top Chef Canada: All-Stars airs Sundays at 10 p.m. ET/PT on Food Network Canada.